Well, after almost 15 years of having the store, it has happened. A customer asked me to remove a book from my shelves. This has never happened before. We’ve had people move books they thought were objectionable, but never has someone looked me in the eye and said, “Are you the owner? I want you to remove this book because it makes fun of childhood sexual abuse.” I apologized that she found the book objectionable and gave her a refund. 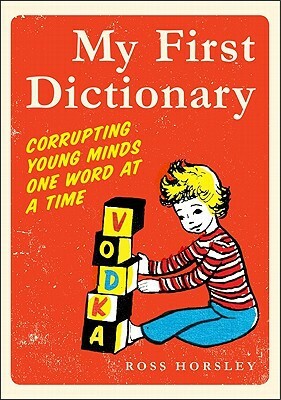 The book in question is My First Dictionary: Corrupting Young Minds OneWord at a Time by Ross Horsley. Does this book cross the line of good taste? Sometimes, sure it does. But honestly, so do lots of humor books. Parts of the book are laugh-out-loud funny, and parts of it made me cringe. I try to warn customers that sometimes it’s a little bleak. There are some letters about abandonment and parental drinking that seem particularly cruel. Permalink Submitted by Bibliofuture on May 25, 2011 - 5:23pm. Permalink Submitted by SafeLibraries on May 26, 2011 - 12:18pm. It's not censorship. Some random annoyed customer telling some store owner to remove a book is simply not a censorship issue. That said, the store owner should take advantage of the situation to promote sales of the book and encourage reading generally, all without ridiculing or even mentioning the individual who complained. Perhaps a large window display and web site promotion would do nicely. Permalink Submitted by Anonymous (not verified) on May 26, 2011 - 1:52pm. The customer bought the book without realizing what was in it? The window display should include "Go the $%^& to Sleep!"